Across the geek landscape, there are these thespian discussions debates as to what the alphabet ‘i’ means in the iMac, iPod, iPad and iPhone. While one side debates about it being synonymous to the Internet, other factions often debate it and come up with a number of arguments as to why it wouldn’t always be the internet. Well, we’re here to settle all scores. Those who say that it does stand for the Internet are not wrong, but not entirely right either. 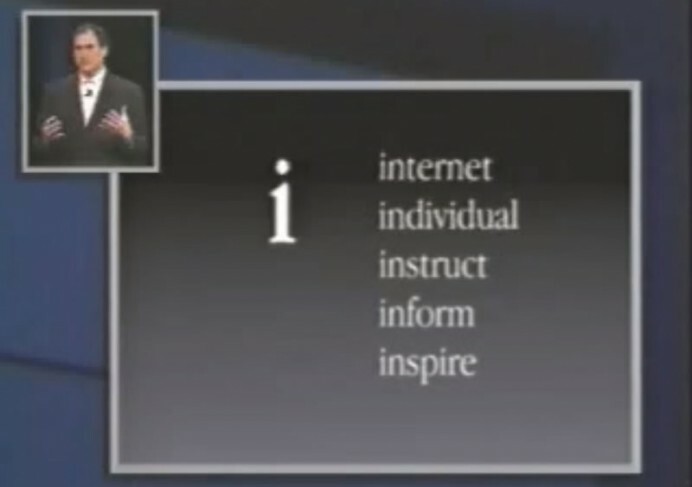 In fact, Steve Jobs, in his 1998 keynote that unleashed the iMac made it clear what the alphabet stands for. In addition to the Internet, it also stands for ‘information, individual, instruct, inform, and inspire’. Mr. Jobs’ address to the crowd was quite a memorable one as were the gasps and smiles from the crowd as they set their eyes on one of the first ‘i’-labelled devices to have made it to the world. What followed is history. History that will continue shaping the way we think about design and all those wonderful attributes that the man himself outlined.